When I mention Google web history to people, they think of web cookies and the items they typed in Google’s search box. Many people are comfortable with their browser storing this information. If not, they delete their browser cookies and cache. However, Google can capture a lot more than those info nuggets. In fact, they can use that data to refine your future search results. This is all part of Google’s effort to deliver personalized search and faster pages. But many people worry about this information. 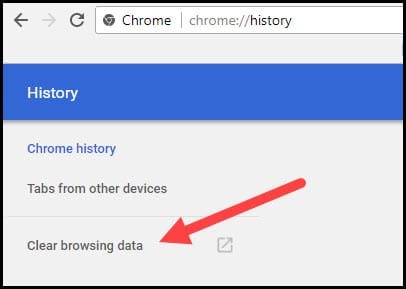 What is in Google Chrome Web History? When you use Google Chrome or other Google products, a log entry is made reflecting your actions. You might think of Google web history as an online audit trail of your web activity. Although it doesn’t store the page contents, it does grab the URL, favicon, page title and timestamp of pages you’ve viewed. In the picture below you can see I’ve read an email, checked the weather and visited Amazon. You’ll also see the top entry recorded a Google search. Everyone will have different items and it also depends on your Google Activity Control settings. And depending on your account settings, you might see activity from other devices such as phones, computers, and authorized 3rd party apps. In the screen snap below, you can see activity from my cell phone and another computer. I was able to see this activity even though I am logged in on a different PC. My guess is people who didn’t know browsers capture this info, might be a bit alarmed. It can be creepy to see this info. The flip side is I’ve also used this web history log to find pages I visited and forgot. This keeps me from repeating Google searches or playing web charades with myself. Some of these settings are also useful with other Google products. 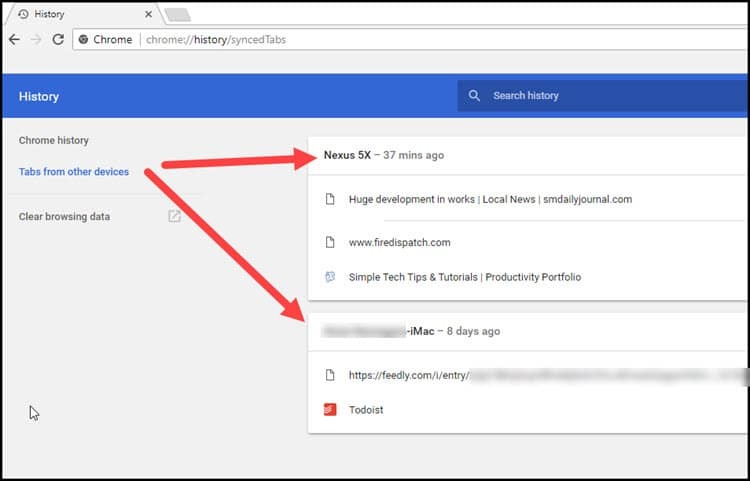 One important note is that Google Chrome isn’t the only browser that records your web history. Mozilla Firefox and Microsoft Edge do as well. 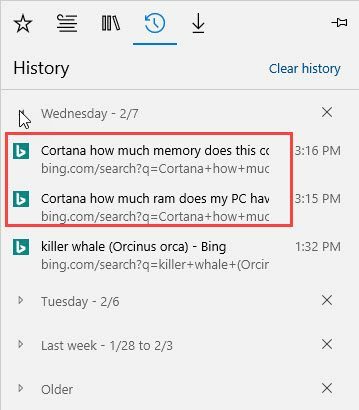 The example below is from Microsoft Edge which logged my voice queries to Cortana and an errant click on my desktop screensaver. In neither case did I have that browser open. Moreover, most website also record entries in web server logs. Some of these items can pass between browsers if you’re logged in. 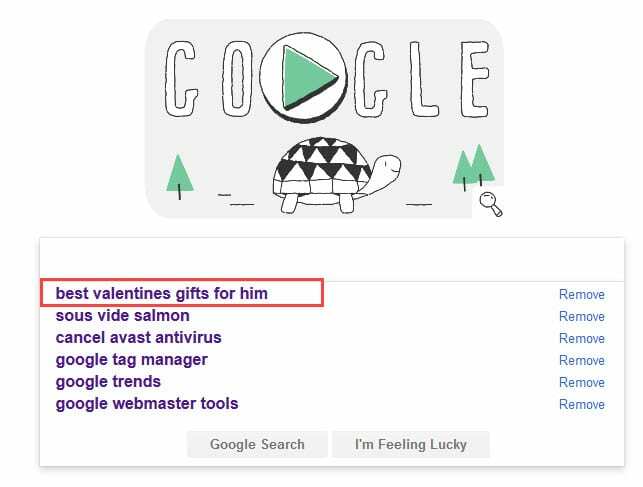 For example, the Google search I did for gifts was done using Google Chrome while I was logged in. If I go to Firefox, log into Gmail, and then do a Google search, my previous queries show. The same keystrokes also work on Mozilla Firefox and Microsoft Edge. One nice feature is that you can act on your stored data. You can use the search text box to find a site you can’t remember. For example, while searching for a restaurant recently, I reviewed many online menus. Later, I needed to find which of the menus had a salmon entrée. 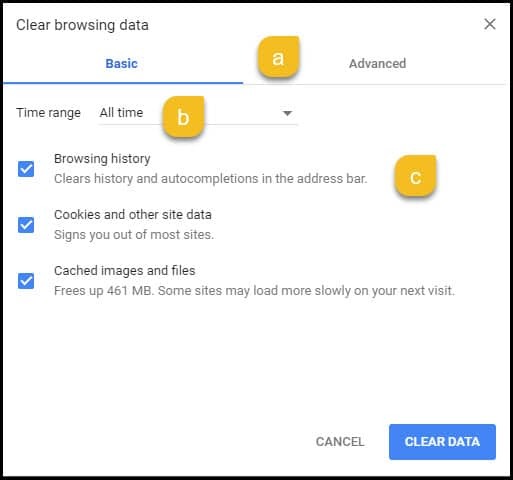 Google has provided several options for people to remove data. You can selectively check items and delete them from your web history. This is a useful feature around holidays where maybe you don’t want tracks left at online retailers. You can also delete all the history. It could be that you’re just worried about some entries. In that case, you might want to use the search bar at the top and isolate your entry. The tool does a good job of looking through the page titles and URLs for your term(s). You can then tick the checkbox to the left of the items and click Delete toward the top right of the toolbar. Using More from this site acts as a filter. It will place the domain name in the search bar and show the results. You’ll have to check each item. Remove from history works well on single items. The steps below are for deleting all your data. However, if you’ve never done this, I’d do this in stages. For example, maybe start with just deleting Browsing history. You may find that if you delete everything you’ll have to authenticate with your sites again especially if you use 2-factor authorization. From the left side, click Clear browsing data. [a] – There are 2 modes, Basic and Advanced that acheive the same results. The Advanced view is more granualar. [b] – This Time range setting allows you to select a deletion period ranging from Last Hour to All time. [c] – You can select the type of data to delete. Keep the default Basic mode. Tick each checkbox for Browsing history, Cookies and < strong>. Your data should be gone and you’ll be on chrome://settings/. For people that are concerned about this data, you probably should routinely delete your data or use private browsing or incognito mode when online.